So I feel like the summer is almost over. Well it kinda is but we still have a couple of weeks before our CC Community starts up this year on Sept 4th. If you don’t already know, we Sanford’s homeschool our girls. Last year was the first year to attempt to teach both of them and it was an interesting ride. We use Classical Conversations as our means of curriculum and organization in our schooling efforts. Go can go here if you would like an overview of CC. I am going to use these last couple of summer weeks left to start gathering my info and resources to supplement our Memory Work. Blessing towards you, I plan on sharing what I come up with. Plan on checking back each week (Starting Aug 6th so we are a few weeks ahead ) to see new information and resources to help your homeschool efforts too. 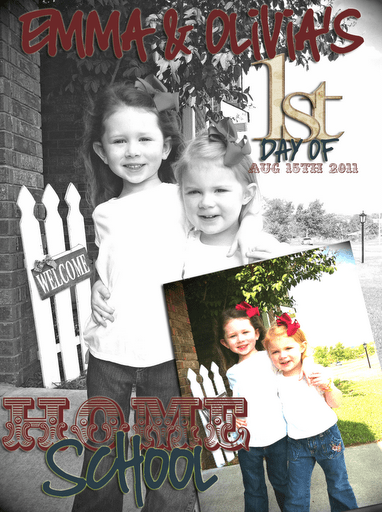 This was them last year on their first day of homeschool for 2011. Don’t they look like eager learners? If you would like to learn more about Classical Conversations go here. Remember to check back next week for C1|W1 resources 2012 & C1|W1 Resources 2015. What curriculum to do use to teach your children? Are you ready for school to start back up?